Description: This tree is 40-80' at maturity, forming either single or multiple trunks and a relatively open ovoid crown on each trunk. 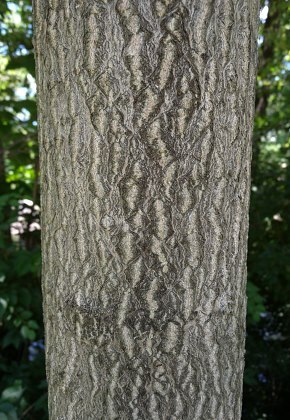 Trunk bark is mottled light and dark gray; it has weak furrows and ridges that are irregular and fragmented. Branch bark is light gray with abundant lenticels (air pores), while young shoots are yellowish brown to green, relatively stout, and usually glabrous (sometimes temporarily pubescent). Alternate compound leaves about 1-3' long occur along the shoots; they are odd-pinnate (less often even-pinnate) with 11-35 leaflets. Individual leaflets are 3-6" long and 1-2" across; they are lanceolate with smooth margins, except near the base, where 1-2 pairs of blunt dentate teeth usually occur. The upper leaflet surface is dark green and glabrous, while the lower surface is pale to medium green and glabrous (or nearly so). The short petiolules (basal stalklets) of the leaflets are up to ½" in length. The petioles of the compound leaves are 3-6" long; their bases are swollen. Both the rachises and petioles are light green to red and glabrous (or nearly so). The crushed foliage of this tree has an odd scent, resembling a mixture of citrus and skunk-like odors. Tree-of-Heaven is dioecious, producing either all male (staminate) flowers or all female (pistillate) flowers on the same tree. These greenish yellow flowers are produced in panicles about 4-12" long. Male flowers are up to 1/3" (8 mm.) across, consisting of a short calyx with 5 lobes, 5 narrow petals, and 10 fertile stamens. Female flowers are up to 1/3" (8 mm.) across, consisting of a short calyx with 5 lobes, 5 narrow petals, 10 pseudo-stamens that are sterile, and 5 carpels with united styles. The male flowers, in particular, exude an unpleasant skunk-like odor. The blooming period occurs during mid- to late spring. While the male flowers wither away, the female flowers are replaced by single-seeded samaras that mature during the late summer or fall. Individual samaras are about 1½" long and 1/3" (8 mm.) across; they are initially light green, but later become yellowish or reddish green, and finally become tan to brown. Each samara has two elongated membranous wings and a central seed; the wings are often slightly twisted. Individual seeds are about ¼" long, ovoid, and slightly flattened. The samaras are distributed by the wind or water. The root system is wide-spreading and relatively shallow; clonal offshoots are sometimes produced from long underground runners. Cultivation: The preference is full or partial sun and moist to mesic conditions. Many kinds of soil are tolerated, including those containing loam, clay, rocky material, and sand. This tree tolerates most types of air pollution, although it is somewhat sensitive to ozone. It will also grow in contaminated ground that contains mercury and other toxic compounds. Growth and development are quite fast, although longevity of individual trees is short (usually about 50 years). The roots and foliage secrete a phytotoxic chemical, ailanthione, that inhabits the germination of seeds and stunts the growth of other species of plants. The wide-ranging roots can clog sewer lines and water pipes, and they have been known to penetrate street pavement and uplift the foundation of buildings. 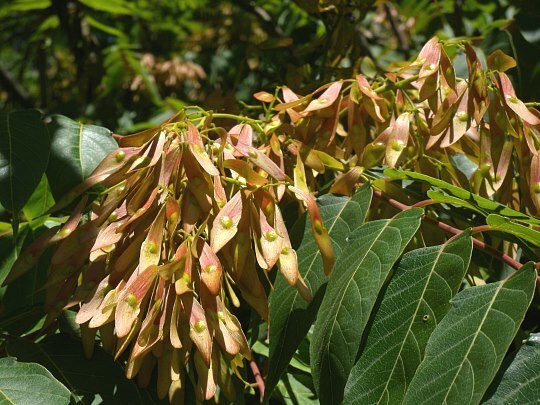 Range & Habitat: The non-native Tree-of-Heaven is occasional to locally common in most areas of Illinois, except the NW section of the state, where it is apparently uncommon (see Distribution Map). This tree was introduced into the United States from China as an easy-to-grow landscape tree. This tree is invasive and it is undoubtedly still spreading into new areas. Habitats include woodland edges and openings, thickets, riverbanks, vacant lots, landfills and dumps, gravelly back alleys, areas along roads and railways, fence rows, and urban waste areas. This tree is more common in urban areas than rural or natural areas; it is especially common in impoverished and poorly maintained areas of cities, where it is sometimes cultivated as a yard tree. 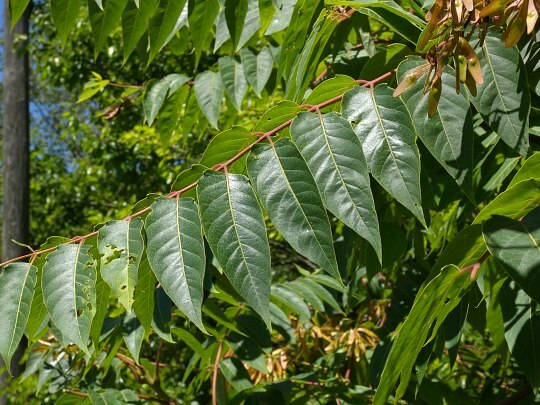 Tree-of-Heaven is a pioneer species that prefers areas with a history of disturbance. Faunal Associations: The flowers are cross-pollinated by such insects as honeybees, other bees, beetles, and flies. Aside from seeking nectar and pollen from the flowers, very few insects feed on Tree-of-Heaven (at least in North America). The caterpillars of two moths, Atteva punctella (Ailanthus Webworm) and Samia cynthia (Ailanthus Silkworm), feed on the foliage of this tree. Some birds, like the Pine Grosbeak and White-Winged Crossbill, eat the seeds. There are scattered reports of limited browsing by deer on the foliage, and cattle sometimes browse on seedlings. Photographic Location: A riverbank near Busey Woods in Urbana, Illinois. Comments: This is essentially a weed tree that has acquired such nicknames as 'Stink Tree,' 'Ghetto Palm,' and 'Tree-from-Hell.' Because of its pinnately compound leaves, Tree-of-Heaven superficially resembles Juglans nigra (Black Walnut) or one of the Fraxinus spp. (Ash Trees). Black Walnut differs by having serrated margins along its leaflets (not just one or two pairs of basal teeth per leaflet), while Ash trees differ by having fewer leaflets per compound leaf (usually 9 or less). The samaras of Tree-of-Heaven have their seeds in the middle, while Ash trees have their seeds located at the top of their samaras.